Some of you may remember my awesome pajama skirt from this May. When I made that project, I actually bought a second pair of pajama pants to turn into a skirt. They never got finished (although they certainly got started). So, as I was fiddling around with the sewing machine, getting started on Max’s costume (Thor costumes don’t just make themselves, you know) I decided to finish it up. This photo was taken for me by Max. So take that for what it’s worth. I didn’t add the little kick pleat to this skirt; I just cut off the crotch-seam triangles and sewed it straight down the front and the back, then hemmed it up. 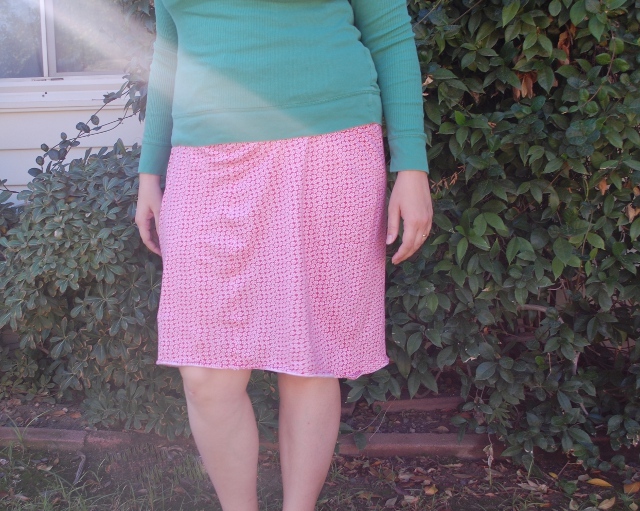 These skirts are ridiculously comfortable, fairly easy, and rather cute if-I-do-say-so-myself. The print on this one is just a bunch of little white flowers on pink; much more subdued than the happy pineapples of the other one. Again, though: flowers on pink make a cute and subdued skirt, but flowered pink pants make you a crazy person or a bum. How does that even make sense? You may also have noticed that I’m wearing a long-sleeved shirt in the photo! Yes, the heat is sullenly relinquishing its hold on this little patch of death country, and it was about 70 degrees this morning. Now, of course, I’ve changed into a short sleeved shirt. It’s going to overtop 90 degrees today, and I’m not crazy. This entry was posted in Finished, Other Projects.